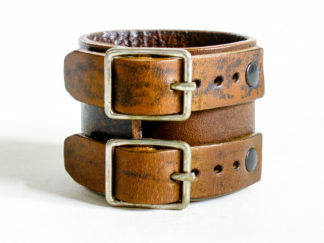 Official simplified version of Johnny’s Cuff, made by the same hands as the one Johnny wears. 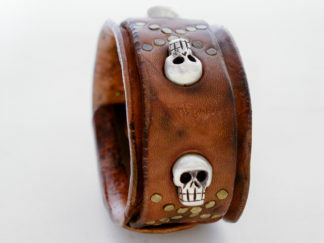 “Close To Johnny’s” Cuff. After the release of “Pirates of the Caribbean, Curse of the Black Pearl”, July 9, 2003, gbb Custom Leather began receiving angry emails from Johnny Depp fans all over the world. Most notably, Japanese fans were furious when they received badly designed and executed fakes of the cuff made for Mr. Depp during filming. 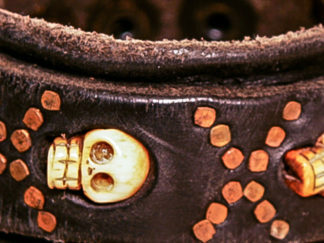 The cuff was ubiquitous because of the print publicity surrounding the film. 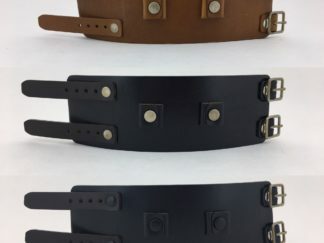 Puzzled, at first at how Japanese clients, usually very attentive to detail could be fooled, gbb Custom Leather looked into the fake bracelet sellers’ websites. The makers of the phonies were using a photo of Johnny wearing his authentic gbb Cuff! Mystery solved. They’re still at it. Like Johnny Depp, customers of gbb Custom Leather, old and new, deserve high quality. You can expect the finest materials and craftsmanship. 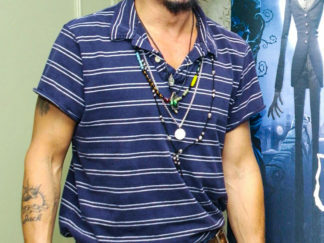 Your cuff will darken with age and exposure to sun and oxygen, just like Mr. Depp’s. 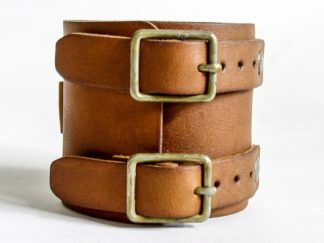 The new “Close to Johnny Cuff” looks like Johnny’s. 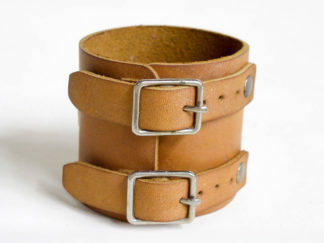 I’m extremely happy with my recent purchase of this cuff. It looks even better and higher quality than any pics on the web (the ebay ones are the closest to what I received). The edges of mine are very clean for a raw cut piece, and the underside is smooth and comfortable. I’m sure the pigskin lined JD Watch Cuff must be even better. If you’re considering this, just go for it. For anyone out there thinking of using this as an actual watch cuff, here’s some info: The rivets aren’t snaps or Chicago screws so you need to make sure your watch fits. It seems like a 42 mm outside pin to pin is close to the max. You thread the spring bars through and do it like it’s an ordinary strap. . I just mounted a JCrew Timex Military watch successfully, and it looks great. The vintage military issued MIL-W-46374 and GG-W-113 (from the 60s, 70s, and 80s) should fit as they are about 1 mm smaller than the JCrew Timex. This model was introduced during the Vietnam War, so in keeping with the Depp “Platoon” world it is a good match, I think. Highly recommended, A+, 5 stars. Just received my “CTJ” cuff, and I must say that I am thoroughly pleased with the authenticity and craftsmanship of the bracelet. 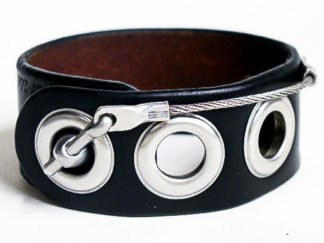 Being a large fan Depp’s jewelry and style since the “Fear & Loathing” days, I can say this bracelet gives you an inexpensive starting point for you to create your own stories and memories just like Johnny when he received his cuff. I definitely plan on getting the other versions of the cuff with time, but for now I’ll sport mine as it is, and let the elements and time do the rest and really let the true character come out.